The modern phenomenon of homelessness – in the form of refugees fleeing the Middle East – is not unique within the border of Europe. For generations homelessness – even during peacetime – has existed inside Europe but it was often swept under the carpet; ignored as an inconvenient truth in our former pre-2007 prosperous lifestyle. Inside Europe, the homelessness of Europeans – both single adults and for adults with families – has long been, and remains, devastating in its consequences. 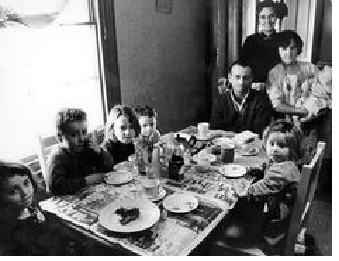 As long ago as 1933 George Orwell published “Down and out in Paris and London” describing the same phenomenon movingly and at length (an extract is featured at: http://fathersforlife.org/hist/tramps.htm). In fact, it is so far-reaching in its destructiveness that it is almost impossible to itemise all the impact areas. However, we can itemise the broader categories namely; lower productivity; poorer self-esteem; psychological; higher social poverty; actual poverty; shorter life expectancy; absent GDP and taxation; ghettoisation; and negative economic output. This is the conclusion of a new survey ‘At what cost ? Estimation of the financial costs of single homelessness in the UK’, undertaken by Nicholas Pleace and offers to serve as a templates for all European countries and their political leaders. It leaves people vulnerable and isolated. They have no support systems to reply; no base they can build from, no quiet time to plan for a better future, no inner tranquility from which to operate from or think tactically and strategically about improving their conditions. Instead some, perhaps many, turn to drugs, alcohol or even suicide as a relief to dull their inner pains. The repetitive portrayal in mainstream media of the many struggles facing Syrian refugees are mirrored exactly by Europeans who are also homeless but who have today been eclipsed. A very recent 2016 British study by the Ministry of Justice Analytical Series, “Child outcomes after parental separation: variations by contact and court involvement” (2016) underlines how damaged personal traits can become if people – at any age – feel vulnerable, neglected and isolated. 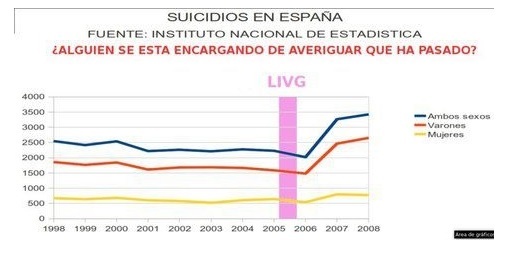 The Spanish graph below shows how just one change to domestic violence laws, in 2006, can dramatically affect suicide rates. In that year men could be unilaterally and without ‘due process’ ousted from their homes and denied any contact with their children. Suddenly without a permanent address, i.e. homeless, many of them lost their jobs. PEF (Platform for European Fathers) – because its members are drawn from all corners of the EU – has the unprecedented advantage of being able to step back and view social legislative changes in Europe as if from afar. It can pinpoint and compare the social impacts of such legislation from across the whole of Europe and identify the cardinal differences of where one nation succeeds but another fails. PEF believes that society itself is the beneficiary when everyone deserves a place to call home and the chance to live a fulfilled and active life. PEF helps people to re-build their lives, not through housing or providing health services, education or employment services but by providing the first steps to stability (the framework) so that these other goals may then become attainable. There are many reasons for homelessness and the consensus is that the individual concerned has largely brought it upon themselves – yet closer inspection shows this to rarely be true. Indeed, the old Victorian social values of the “Deserving poor” versus the “Undeserving poor” are as powerful today in 2016 as they were in 1886. Among the many reasons for homelessness in our modern society it has been shown (over many years) that loss of employment by the main breadwinner (e.g. redundancy), and the inability to maintain payments can lead to other consequences. Unemployment can lead to the inability to pay a mortgage or a rental property and in turn this can lead to marriage breakdown. It can happen in reverse order, where the marriage breakdown can lead to demotivation and the subsequent loss of employment. Marriage breakdown can lead to stress related heath symptoms and sometimes inter-family violence. 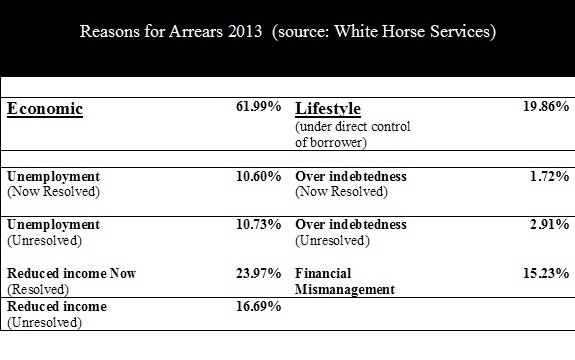 In Britain ‘White Horse Services’ (see below), has specialised for many years in assisting mortgage company lenders to restructure “at risk” client mortgages and have long ago identified 5 principle causes (see http://whms.co.uk/). Different European countries have a variety of measure for homelessness. 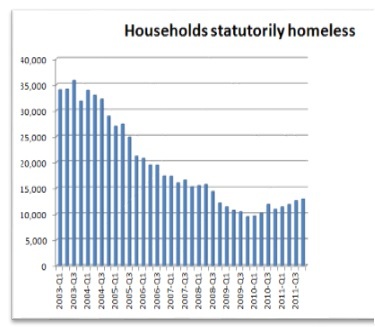 Homelessness in the UK (as measured by households deemed by statute to be homeless), was once declining but the banking crisis of 2007 reversed that trend. Even a cursory glance of the White Horse analysis shows that under-employment or shorter working hours can, bizarrely, be twice as detrimental to the ability of mortgagees to maintain their monthly mortgage payment compared to outright redundancy or total unemployment (see Appendix 1). 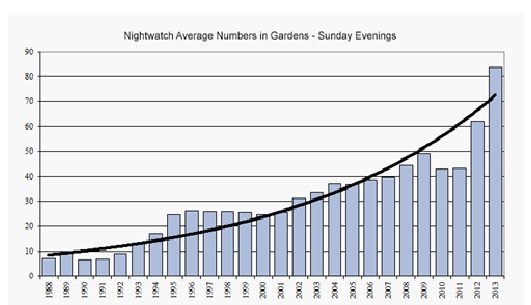 At the ‘coal face’ of actually counting the homelessness on a Sunday evening ‘Nightwatch’ (see graph below), found an almost unremitting upwards trend from 1988 to 2013 (source: Joseph Roundtree Foundation). Every year the organisations belonging to PEF work with hundreds and thousands of people across the EU from all walks of life. Some are homeless; some widowed; some divorced; some who have lost their children in a separation; and some simply left utterly demotivated from life’s many cruel blows. No one organisation can tackle these many social issues but given the right recognition there as NGOs, including PEF, who can begin to make a difference. But it will take politicians with imagination and foresight to begin to realise these ambitious plans and to start work through these problems. PEF together with other NGOs are all determined campaigners working to prevent people from falling foul of ‘The System’, the bureaucratic bungling, and lethargy; regulations and judicial decisions. It is always the dis- possessed who are least able to counter these on-rushing and all-crushing forces which crowd around them uninvited.dis-possessed who are least able to counter these on-rushing and all-crushing forces which crowd around them uninvited. Among the homeless are the forgotten homeless, namely homeless fathers. Homeless single men already have a modicum of shelter provision and this we firmly believe should be improved and broadened– but a father with children has absolutely nowhere to go. PEF in concert with its members seeks to change the way society and government thinks and acts towards homeless people – and homeless fathers in particular. * As can be seen from the above Table over 80% are due to just three types of event, however, there are in total 5 principle causes. This underscores the success of intensive counselling of borrowers which played a very important role in limiting the numbers of home repossessions during that era’s recession. It also reinforces the attitude adopted by Please, and the research from North America, namely that to intervene early is cheaper (and more effective ?) than waiting to apply a remedy for a totally ruptured situation. White Horse Services can speak with some authority since they have counselled tens of thousands of borrowers in arrears and to them it is clear that many mortgagees are naive in rudimentary financial management and have little appreciation of mortgage delinquency implications. Politically, the same 20 year span (and particularly 2005 – 2015), has been as arid for men and fathers as it has always been (see Appendix 3). The stereotypical tramp of the 1950s and 1960s would be an ex-Guards officer who could not settle back into civilian life, or who had been dealt an awful hand of cards. 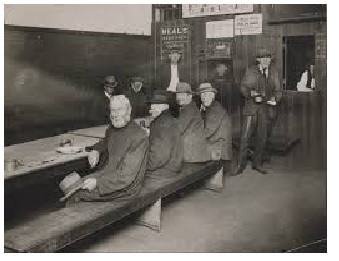 They would sleep rough all year moving from one town to another and occasionally be taken in by a friendly police station for a shower, a shave, delousing, a general wash up and be given a warm bed in a vacant police cell for one night. Homelessness is one of those rare statuses in life or event that knows no fashion trends. It is an indictment of how we deal with this segment of our society that pictures taken of the homeless inside hostels cannot be dated. Photographs taken in the 1890s and 1930s and 1950s are interchangeable – all look alike as the following array demonstrates. 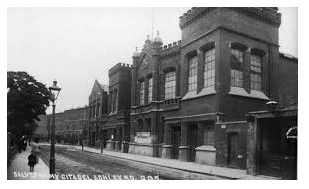 The Salvation Army was born out of the Victorian slum poverty and fended off the alternative which every town then had, namely ‘The workhouse’, dreaded by many, and rightly so. But surely it is the father of children, or a father with dependent children living with him who is most marginalised, as he is not treated as an urgent priority in local council housing needs, and no hostel can accommodate him and his children ? He has the choice of a hostel for single men and having his children go into care. Yet we know from the above Report that a large number of boys and girls are from the very same ‘care system’. Left: the austere façade of many Victorian Salvation Army hostels for men. ” . . . Tramps are cut off from women, in the first place, because there are very few women at their level of society. One might imagine that among destitute people the sexes would be as equally balanced as elsewhere. But it is not so; in fact, one can almost say that below a certain level society is entirely male. “- In the crypt of St Martin’s-in-the-Fields Church, 88 men, 12 women. “- In the L.C.C. casual wards and hostels, 674 men, 15 women. It will be seen from these figures that at the charity level men outnumber women by something like ten to one. The cause is presumably that unemployment affects women less than men; also that any presentable woman can, in the last resort, attach herself to some man. The result, for a tramp, is that he is condemned to perpetual celibacy. For of course it goes without saying that if a tramp finds no women at his own level, those above – even a very little above – are as far out of his reach as the moon. The reasons are not worth discussing, but there is no doubt that women never, or hardly ever, condescend to men who are much poorer than themselves. A tramp, therefore, is a celibate from the moment when he takes to the road. He is absolutely without hope of getting a wife, a mistress, or any kind of woman except – very rarely, when he can raise a few shillings – a prostitute. NB. When Glenn Cheriton of the Canadian Equal Parenting Council interviewed the executive director of the Union Mission for Men, a homeless shelter based in Ottawa, Canada, he found double standards of treatment operated. Their executive director said that most of the men who she saw go through the shelter were fathers. Furthermore, she said that when women have “a problem” or social problems, e.g. alcohol abuse, joblessness, mental problems, divorce, etc., etc., a whole array of government and social services of programmes are available to help them and their immediate families, i.e. dependent children. But this is absent when fathers present with or without their children. For them there are no programmes or remedial course. Any weakness, such as divorce, alcohol abuse, mental problems, etc., is put down to ‘lacking moral fibre’ and effectively the person not being worthy of investment or of much value to society. As a result men are discarded from the official mind as if not meriting the same level of sympathetic response. Effectively this official attitude cuts fathers off from family and family support – but it also cuts children off from their fathers. Until the introduction of the Housing (Wales) Act 2014, the Council was not required by statute to produce a Homeless Strategy which included a review of homelessness services since the 2002 Act. We are required to produce a Homelessness Strategy by 2018 in accordance with the 2014 Act and the process will require a review of homelessness in order to inform the strategy. We are, therefore, planning a review to take place during 2017. “Guidance on Applying for Funding to Support a Homelessness Strategy” (Feb 2005, https://www.nao.org.uk/wp-content/uploads/2005/02/0405286es.pdf ), aimed to reduce by two-thirds (66%), the rough sleeping levels of 1998. The estimated number of ‘rough sleepers’ on England’s streets was put at 1,850 on the night in question (excluding Wales and Scotland etc.). The paper admits the policy has failed. Very little has changed. In the same 20 years but particularly the 10 years separating Baroness Scotland, in 2005, and George Osbourne, in 2015, nothing has changed for men and fathers (see Appendix 3 and Appendix 4, ‘The bed and breakfast option‘). Across the Western world those prepared to protect and promote men’s and fathers’ equality of rights when they speak with those in charge of men’s shelters get similar comments. Only when politicians and funding services recognise this gender discrimination can they cajoled into providing services comparable to those provided for to women. Homelessness exacts a personal cost to those who endure it. In addition to the trauma and the emotional duress that can accompany the precipitating events of one’s loss of family home, self-respect. 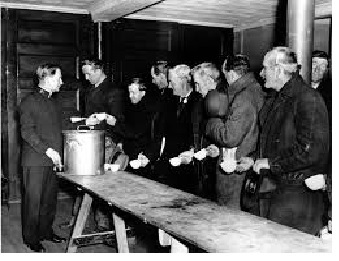 Once people become homeless they experience the indignities of destitution, cow-towing to the demands of state benefits officers, surviving at the hands of charities. Being prepared to be ‘means tested’ about one’s intimate life by total strangers is just one of the indignities expected of supplicants if they are to stand any chance of having their needs met. 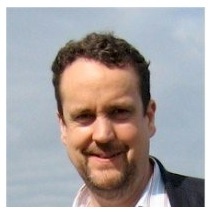 Nicholas Pleace, of the Centre for Housing Policy, University of York, (“At what cost ? Estimation of the financial costs of single homelessness in the UK”, July 2015), also points to the many cases where victims of homelessness spend many hours of each day in ‘public spaces’ and where they are exposed to street sub-culture, of gangs of youths intimidating older adults, of violence, theft, physical victimisation and being tricked or set up by the same street sub-culture. It can mark the beginning of a steep downward spiral. His report relies on the use of qualitative and service cost data drawn from recent research, in order to present estimates that provide an overview of the additional financial costs of single homelessness can cause for the public sector. However, his conclusions are sustained by empirical evidence from White Horse Services going back some twenty years (see below). At first sight the negative social impact may be thought to be confined to a small minority and not a great burden on the taxpayer. However, marital breakdown now affects a large percentage of those who form a household and in absolute terms is around 120,000 per annum in England alone. 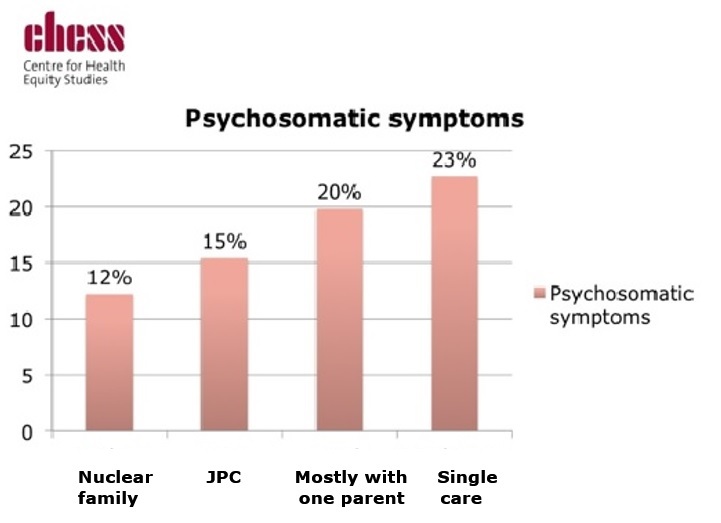 If just one aspect is looked at in more detail, such as the physical and mental health implications and the cost arising therefrom, then a tawdry picture of damaged families producing damaged children emerges. If we take the impact on children of divorce and family break up as approximation to the impact of unemployment etc. 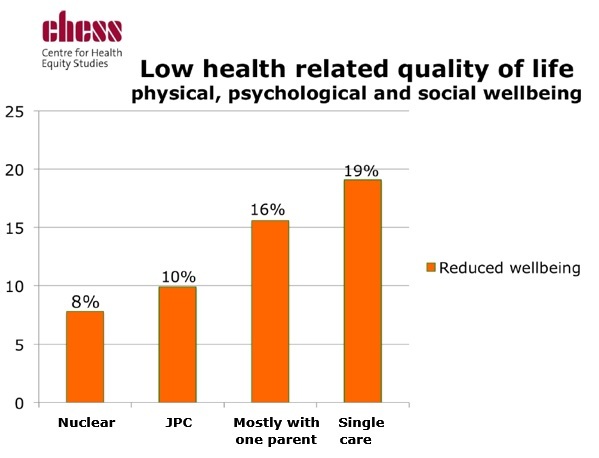 then by analogy we can see from the graphic below that children experience a better health and quality of life if their parents are not stressed by separation (nuclear family vs single mother care). It is perhaps an indictment of the lack of seriousness with which we as individual countries have viewed homelessness in general that even after spending significant periods of time on a range of treatment systems, many people remain homeless with further costs yet to accrue because they remain homeless and will remain so until there is an endgame of a housing plan. “The benefit to the individual family and society would be considerable, not just in emotional terms but also in reducing the millions of pounds lost each year within the housing market and the lending industry generally”. Were it to be made possible to replicate such a reconciliatory regime on the same scale, but for divorce, the impact on homelessness would be huge and immediate. Children from broken families are often taken ‘into care’ and into local authority ‘residential homes’ – only to leave aged 16 and become the next generation of the homeless. The 2015 report by Nicholas Pleace, “At what cost ? Estimation of the financial costs of single homelessness in the UK”, marks an attempt in the UK to begin putting some faces and costs on the problem, and in so doing draws on earlier research (2002), in New York City which tracked nearly 10,000 people who were homeless. Average costs of services used came to $40,500 per person per year (in 2002 dollars), in this early New York City research (included time spent in hospitals, shelters and jails). The nearly 10,000 homeless people had severe mental illnesses and although mental illness is not always present among the homeless population it is not uncommon and if absent initially can certainly be induced by events after a period. However, once housed, these costs were reduced such that they effectively offset the entire costs of providing people with housing subsidies and intensive supportive services. Has the Commission, or any institution in Europe begun addressing this problem ? It is to be hoped that such information and evidence will inspire a deeper investigation and investment in solutions within England & Wales. Of course, all is not as simple as this argument may imply. Many people who experience long-term homelessness are not high cost service users, at least in any given year. Longer term studies are needed, but in the shorter run anyway, many people in any given year who are homeless seem to fly below the radar and are caught only when they collide with authority and who then turn to charities to help them e.g. PEF’s pan-European abilities. The prospect of off-setting the housing costs of these ‘unknown’ clients seems less than achievable but once a quantity of them are identified it will create an atmosphere where the numbers flying below the radar can be more readily captured and assisted. ‘Homelessness prevention’ programmes that try to avert the onset of homelessness in the first place can be complicated to construct and, in common with an ‘all-risks’ insurance policy, often far too expensive to afford. For this reason and a variety of others broad-based prevention programs for those ‘at-risk’ might therefore need to be relatively “light touch” and low-cost to achieve cost effectiveness. There is a need for a better understanding of the costs in the UK of single homelessness and of homelessness costs incurred by a parent – male or female – with dependent children. Some data is available but it is always dangerous to place too much confidence in so small a sample. 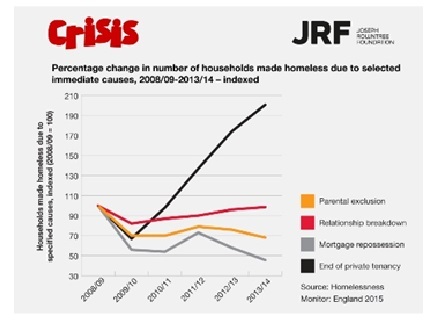 So with that caveat, here are some data, albeit anecdotal, gleaned by “Crisis”  concerning a young single woman; a single man in his 30s; and a man with a learning difficulty who loses his existing home but all are ‘sleeping rough.’ The financial cost scenarios envisage the price where a). homelessness is prevented or quickly resolved is compared to b). homelessness persists for 12 months. In the first example (a young single woman), the cost of preventing homelessness would cost the ‘public sector’ an additional £1,558. Allowing it to persist for 12 months would cost £11,733 (all are estimates). In the second example (a single man in his 30s), the figure for resolving homelessness quickly is £1,426, rising to £20,128 if homelessness persists for 12 months. For the third example (man with a learning difficulty), the figures are £4,726 compared to £12,778. The additional financial costs associated with homelessness vary from person to person and by the location, type and nature of the homelessness services support provided. These additional cost, compared to other citizens, are likely to centre around medical or psychological care (the NHS), the criminal justice system (police manpower and court costs), and social services (homeless people have the greater likelihood of more frequent and sustained contact/use of these state agencies). It is always dangerous to extrapolate but in this situation, where there is insufficient concrete data to hand, it is perhaps justified. The additional costs of homelessness can quickly become significant. For instance in the second example (a single man in his 30s), thirty such people sleeping rough for 12 months, with an equivalent pattern of service use would cost over £600,000 a year in additional public expenditure, rising to £1.2 million if the situation persisted for two years. In many ways it is almost immaterial whether we as a society can guarantee a net positive return on any investment in homelessness. What is key is that the public and the politicians come to a point where they recognise that homelessness has a hard cost and a high consequence. ‘Nominal’ values can be part of any theoretical equation to calculate the cost and consequences of homelessness but in the final analysis they are at best arbitrary since what values other than artificial notional ones could possibly be used ? People, including the general public, NGOs, and legislators, do not appreciate that homelessness is never a ‘cost neutral’ option. It may appear that homeless people may not be using mainstream housing resources, but their lives and their use of other acute service systems have the potential to actually spiral out of control. In addition, for people and families at risk of homelessness, averting their homelessness up-front also has the potential to forestall this inevitable decline, and the ravages it can exact on the people and the service systems to which they would otherwise descend. The findings twenty years ago of the White Horse Service organisation, cited above, underline this very point. Instead of working harder and throwing more money at the problem that never seems to shrink we should be working “smarter.” The prevention, and ultimately, the ending of homelessness is certainly smarter and more humane than our present alternative. Its appeal is that it will year on year and in the longer run be less expensive for taxpayers and not require constant budgetary diversion on the present scale. As this document helps to reveal, there is a cost to doing nothing, and a cost to the holes in the safety net. Further investigation through research and further investment of resources can make a potentially life-and-pound saving difference. Homelessness has a human cost. The unique distress of lacking a settled home can cause or intensify social isolation, create barriers to education, training and paid work and undermine mental and physical health. When single homelessness becomes prolonged, or is repeatedly experienced, there are often very marked deteriorations in health and well-being impacting GPs and hospital services together with the panoply of state funded social services. Arrears for both mortgage payments and rental properties can lead to eviction and homelessness. The Table below (left column) shows that complete unemployment can have less of an impact on household security than if the head of household and/or their partner are faced with reduced hours of working, e.g. circa 10% versus 23%. And in the arena of “lifestyle” and “financial mis-management”, it is the latter by a large margin that is the main culprit with “over indebtedness” accounting for only 2% or 3% (right hand column). It seem that people are cautious about becoming over committed which runs contrary to the mainstream of thought on this topic. The ‘Resolved’ and ‘Unresolved’ sub-headings refer, of course, to the arrangements being put in place to rectify the arrears via a payment plan, once the issue of employment has been resolved or payment remains ‘unresolved’ where the person is still out of work. In 2005 Baroness Scotland, who was in overall charge of the UK’s Gov’t Refuge spending for many years and who always blocked funds for male victims, confirmed in writing that for the year 2003-2004 Refuge provision in England totalled £19 million (£10m came from the Housing Corporation and £9m from the Homelessness Directorate). Provincial local refuges that might be considered ‘out of the way’, like the Vale of Glamorgan Women’s Aid, received £226,580 in 2001. “. . .. . With regards to Mr Whiston’s comments on the provision of accommodation for male victims of domestic violence, the Government this year announced major investment in refuge provision in England. A total of £19 million capital was allocated (£10m through the Housing Corporation and £9m from the Homelessness Directorate) for 2003-2004 alone. Not even 1% of this national funding was directed towards male refuges. It should also be noted that the Housing Corporation was originally set up to provide money, loans and subsidies to low income families to get onto the property ladder, not for individual women or Refuges. The Commission – which the Government abandoned in 2010 – had faced criticism for its spending and was replaced in 2010 by the ‘Equalities’ sector of government (see http://wnc.equalities.gov.uk/). Communities Secretary Eric Pickles said the Audit Commission had also ‘lost its way’ and had become a ‘creature of the Whitehall state’ when he announced its disbandment and its replacement in 2015. Therefore, in the same 20 years but particularly the 10 years separating Baroness Scotland in 2005 and George Osbourne in 2015, nothing has changed for men and fathers. Communities secretary Eric Pickles has laid an order before Parliament to scrap house building targets with immediate effect. The move will do away with regional strategies put in place by the Labour government with the aim of seeing 3 million new homes built across England by 2020. A Decentralisation and Localism Bill, expected in the autumn, will set out more details of the government’s plans. But ministers have said incentives will include matching the income councils receive from new homes through council tax for six years after they are built, with the reward increased to 125 per cent of council tax for affordable homes. The nine regional government offices are to be abolished as part of plans to devolve power to local authorities. Communities secretary Eric Pickles has announced the government intends ‘in principle’ to do away with the bodies, which oversee a range of policies at regional level including housing. The government has already said it is getting rid of one of the nine – the Government Office for London. In the coalition agreement it said it was ‘considering the case’ for the abolition of the remaining eight. The announcement that these will cease to exist follows the unveiling of plans to scrap regional spatial strategies, which included regional house building targets, and ties in with the government’s wider policy of transferring power from central to local government. In a statement to Parliament, Mr Pickles said the original intention of the government offices was to join up departmental teams outside London, but that this aim had ‘been lost’ and is ‘no longer necessary in an internet age’. Peter Lay. Joint Chief Executor, White Horse Services. Jan 1996. Peter Lay. Joint Chief Executor, White Horse Services. Jan 1993. Dennis P. Culhane, Kennen S. Gross, Wayne D. Parker, Barbara Poppe, and Ezra Sykes. “Accountability, Cost-Effectiveness, and Program Performance: Progress Since 1998” National Symposium on Homelessness Research (2008). Dennis P. Culhane. “The Cost of Homelessness: A Perspective from the United States” European Journal of Homelessness 2.1 (2008): 97-114. Stephen R. Poulin, Marcella Maguire, Stephen Metraux, and Dennis P. Culhane. “Service Use and Costs for Persons Experiencing Chronic Homelessness in Philadelphia: A Population-Based Study” Psychiatric Services 61.11 (2010): 1093-1098. Rolston, H., Geyer, J., & Locke, G. (2013). Final Report: Evaluation of the Homebase Community Prevention Program. New York City Department of Homeless Services.